This article was discovered, copied, and notated by Julie Schopieray, regular contributor to Grand Traverse Journal and author of the fantastic new biography, Jens C. Petersen: From Bricklayer to Architect. Copies of the book can be obtained from Horizon Books, Amazon, or directly from the author. To every man who fights, grins and wins, this little story is respectfully dedicated. Twenty-five years ago a cross-eyed woman by the name of Borden, taught our school in a little village, and not-withstanding the fact that the years have changed my focus on most things, when I close my eyes to-day, I can still see “Granny Borden,” as we young devils disrespectfully called her, and I realize now, as I could not then, that back of those crooked eyes there was a lot of straight thinking going on, and beneath that old fashioned, cheap, but scrupulously clean plaid waist there beat a warm and honest heart. Tonight as the whistle blows and the boys and girls, singly, in pairs and in groups, trudged on their homeward way past our office window, there was one in the lot, possibly because her eyes were so hung that she could look around a corner and still see what was going on around her, who brought vividly and instantaneously to mind the old school house, the high platform, the long pine table, and back of it, book in one hand and ruler in the other, the school mistress, Miss Henrietta Borden, (that is the older and more respectful people called her “Miss”), but to the younger generation it was“Granny,” (especially when we had to stay after school). And what a delicious half hour that was, sketches and plans for houses, churches, government buildings, and even dinner could go to the dogs, at least they would have to wait for attention from me until my dream was finished. It was Friday afternoon, our freshly dug worms were even now safely hid away in an old tomato can under the back porch, and, as tomorrow was a holiday, Percy and Tart would whistle under my window about four o’clock in the morning, and I would jump into my clothes, grab the piece of bread and butter mother had laid out for me the night before, shoulder my pole and hike across the fields and- – – but time flies. I must have another look at that Friday afternoon picture before I receive another hurry up call from home and am obliged to hide it away to be brought out, well, perhaps never, because I find less and less time for everything, except trying to keep from being run over. Charles has just been called to the platform to speak his piece. By way of inspiration, he rubs a dirty leg with a stone bruised heel and still dirtier foot, and then by fits and starts he laboriously, and to the onlooker, it would seem by main strength, relieves himself or the old-time masterpiece, “The Curfew Shall not Ring tonight.” When he is through the boys snicker as loudly as they dare. “Granny raps vigorously for order, then at a nod from her, Amy our star soprano, sings four verses of “Pull for the Shore,” the whole school joining with her in the chorus. When school is dismissed for the week, the boys yell, hoot, holler, turn somersaults, engage in an imitation fight or two, by way of showing off to the girls, old “Granny” turns the key in the door, and another one of life’s chapters has been unthinkingly, but nevertheless irrevocably written. Percy and Tart are daring me to go swimming, but out of the corner of my eye I am watching a little Miss with yellow braids, who has carelessly dropped away from her companions, just as I am trying to do from the boys. The other girls notice it and quietly smile and whisper to each other, but not in an obtrusive way to embarrass her. Percy and Tart also see what I am up to, but a smile or a nudge is not expressive enough for them, no, indeed. They all become particularly chummy, throwing their arms over each other’s shoulders and pointing their fingers at me, sing out at the top of their lungs, ‘Jens has got a girl, Jens is going home to cut out paper dolls with his girl,” and more of like effect, but I never faltered, those two yellow braids pulling me harder in the direction of the girl than the taunts and jeers of Percy and Tart could overcome, and I pictured to myself two boys who would, each in their turn, receive a nice licking before school opened Monday morning, and I marched over to little Miss Yellow Hair, and the shy but appreciative look I received not only blotted out Percy and Tart and their stinging words, but so blinded my eyes that my world narrowed itself down to a few trees, a path just wide enough for two, a slip of a girl and an awkward country boy. I wonder where she is now, it cannot be that she is married and has sons and daughters of her own, but why not? We were the same age, and look at my boy and girl, not quite so heavy around the waist but both of them growing to be as tall as their mother. The years have come and the years have gone, as years have a way of doing, bring me their mixture of joys and sorrows, of successes and failures, but they have left their memories with me. There are so many roads leading in so many different directions from that little school house that I have lost track of most of my boyhood friends. Some of them I can still place. Fatty Matt, who was, as I remember it, one of our brightest boys, and one for whom a brilliant future was predicted by the entire district, is tending bar I believe in Chicago. Joe, big hearted, warm hearted Joe, I believe died a few years ago in a little town out west. Willie, who was the prize pumpkin in the row, when it came to speaking pieces and showing off on the last day of school, was once Mayor of the little city, is in line for Governor and United States Senator, and will soon be a member of Congress and be helping to make our financial laws. And what of me, well I am in the architectural business, yes, and successful too, at least from a worldly view point. I have one of the finest offices in the state of Michigan, have a nice force of draftsmen and designers and turn out the best work in our line in the country, but really it makes my heart ache when I think of the hills I had to climb and the many hard bumps I received before I reached a point where I dared speak of an assured success. When I left school at fifteen, of course I must work, so father secured me a job to work with him, learning the art of laying brick, and I put on a pair of overalls and went at it. I served my apprenticeship under a mighty good man. He was not the largest contractor in the country— he didn’t claim to be, but he did turn out honest work, and while the old gentleman is away out in sunny California, over sixty years old and still at it, and probably does not know that I am eulogizing him, I want to say that when he closes his eyes for the last time the world has lost at least one honest, competent and operative mason. Finally, in one way and another, and I trust without crowding my neighbors into the ditch, I accumulated enough money to take a course of study in designing, then secured a nice job for a few years with one of the biggest architectural firms in the United States, in an office in the city of Chicago, attended night school and the University of Illinois, finally passing the examinations and accumulated enough to make a humble start in an office for myself. The proudest moment of my life was when I had my first sign placed on my office window. That was some time ago, and the office, while large enough to be noticed quite some locally, was small as compared with our present one. Of course at that time I did not have anything like the facilities that I have today for turning out quality and quantity, but it was mine— the thing I had been striving for had come to pass, and for a little while at least I was peacefully happy. Perhaps I have not received more bumps than come to all of us. In the light of years I have come to believe that I needed them for my development, at any rate I got them, as you get yours. If we use them to our advantage, as I believe we may, well and good, otherwise they may lame us, keep us to the rear, and we go through life nursing our bruises. Just now there isn’t a sore spot on your Uncle J.C., not a single one, because taking everything into consideration, we have the best equipped office for the furnishing of plans for homes by mail in the United States, I realize that this is talking pretty loud, but it is a fact nevertheless. I believe we can turn out more work of the right quality and at a lower cost than any other institution of its kind in existence. When you visit Traverse City, come up and see us. I will refrain from talking business unless you want to, but I will show you the prettiest little city your eyes ever feasted on. We have miles of paved streets and shady drives, thousands of well kept, happy homes, the finest trout streams and the prettiest little bay in the country, and last, but not least, it would give me pleasure to act as your host, and incidentally take you on a tour of inspection through the cases and files and equipment of what I know to be the most thoroughly up-to-date architect’s office anywhere. I issue a large and expensive catalog, showing a few of the hundreds of different styles of houses we plan, and if you cannot possibly make a personal visit, write and I will mail you the catalog, also quote some prices for plans for your home which will be just as attractive to you as the plans represented. You can remember the place and I trust you will be able to remember the name. 418 State Bank Building Traverse City, Mich.
NOTE– My book, the Cream of 1000 Plans, is an expensive catalog and cannot be sent free. If you will enclose 50 cents, coin of stamps, in your letter, I will credit you with this amount when you order your plans. Jens C. Petersen came to Traverse City in 1884, at the age of eleven. Research shows that his parents lived in and were running a boarding house for construction workers, near the site of the Northern Michigan Asylum. The nearest school would have been the Union School between 7th & 8th Streets, where Central grade School is currently located. Petersen talks about his teacher, Miss Henrietta Borden but it’s unclear whether that was his teacher’s real name or if he changed it for the story. I haven’t yet found that there was a teacher in Traverse City by that name between 1884-1889 when Jens would have been in school, however there was a Harriet Borden who taught in Kalkaska for many years between 1880- 1915. It is possible she spent a term in Traverse City as Jens Petersen’s teacher. He talks about “Willie” who was the prize pumpkin in the row, who goes on to be mayor and further into politics. It’s likely he’s speaking of William D. C. Germaine, locally known in later years, as “Wild Bill”. Germaine was three years older than Petersen, but would have been at the same school. He became mayor of Traverse City between 1908-1910 and again in 1912-1913. Unfortunately, Mr. Germaine did not become the successful man Petersen had envisioned in his 1911 writing– in 1912, Germaine was attempting to make a bid for Congress, but by 1913 was removed from office by the governor for extorting money from a local saloon keeper. Germaine was known locally to have trouble with “the bottle.” In 1916 he was arrested for attempted arson, after trying to burn down his his wife’s house after she filed for divorce. In 1923 he was arrested for bootlegging and arrested again in 1926 for prohibition violations. He died in 1943. “Percy” would be Percy Holdsworth. He was a year younger than Jens but while Jens only completed the 8th grade, Holdsworth finished high school, graduating in 1892. 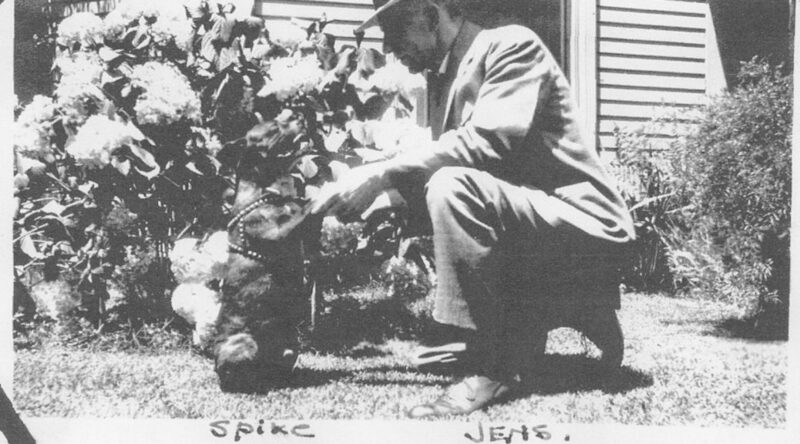 He then attended the University of Michigan, attaining a degree in mechanical engineering in 1898. 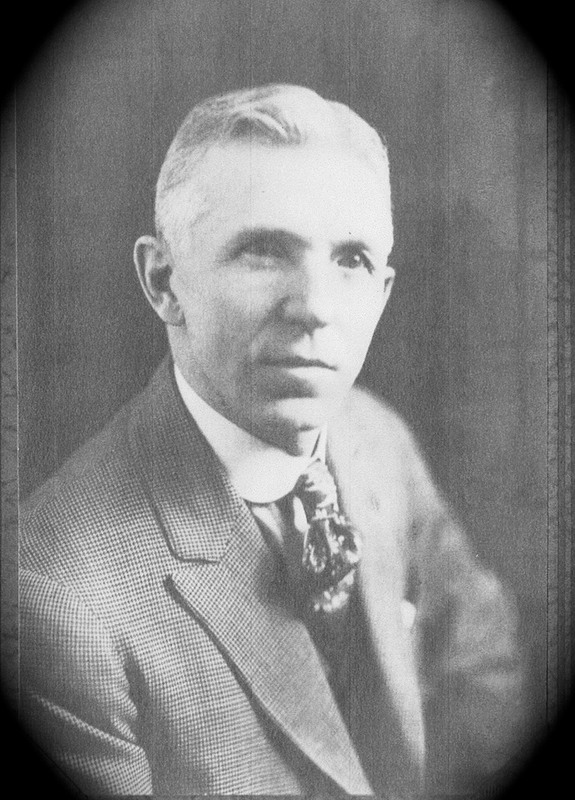 Holdsworth died in Chicago in 1925. You can read more about the life and work of Jens Petersen in Jens C. Petersen: From Bricklayer to Architect. Copies of the book can be obtained from Horizon Books, Amazon, or directly from the author. Stay in touch with author Julie Schopieray and Jens on their Facebook page. I wanted to see if the phrase “off the board” was a commonly used in 1911. The jury is still out, I did find it defined here. In the publishing world, it doesn’t look like it was a common phrase until in mid-1920s, atleast within the monographs scanned in the Google Books Project Ngram Viewer. This high school, featuring the library shown above, received honors for its design in 1959. Gordon Cornwell was the architect of the building. Which school is it? 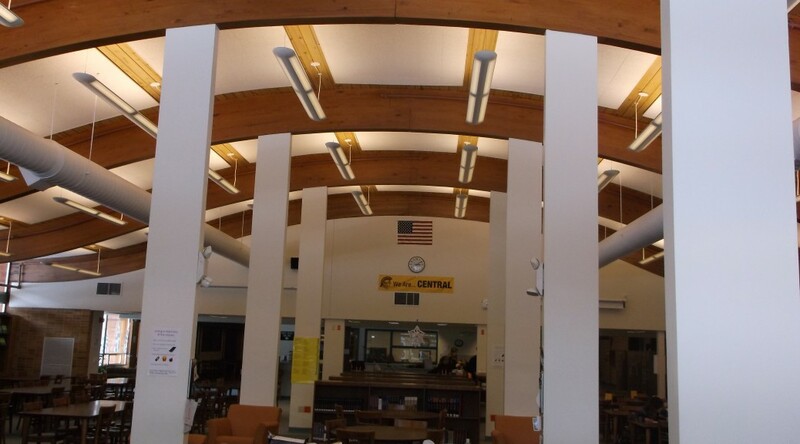 Thanks to reader Charlene, who solved the March Mystery Photo, we know this is the Central High School Library, a place much beloved by former students… or not. Just in time for the coming of spring we reprint this section of a speech delivered by Mrs. Hulst in 1915. There she discusses the possibility of making schoolyards into gardens, advocating that woodlots close to school should be left wild to be used as nature study areas. The essay reminds us of efforts in the Detroit public schools to reclaim lots once filled with residential homes, since fallen to decay, and convert them to vegetable gardens. ….Would it not be an act to merit public gratitude if some one should introduce these rare and lovely things [wild plants] into our landscape? The first thing that we should do is to educate the children and the community to work for beauty. 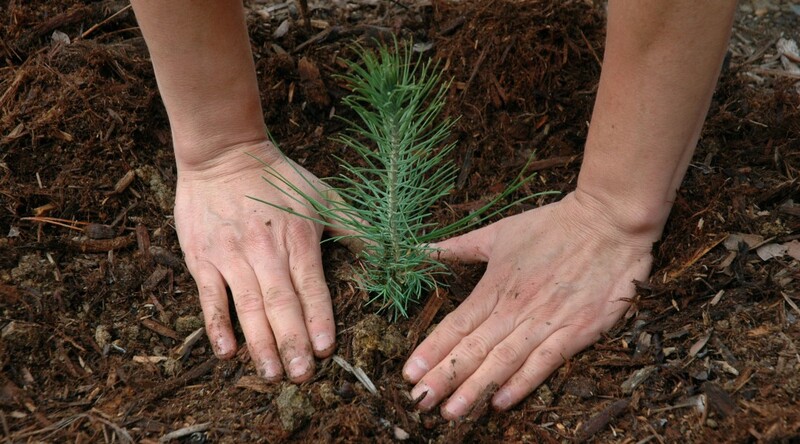 It should be the happy work of the children, aided by the Community, on two joyous Festival Days of the Spring and Fall, to devote time and effort to some public planting of their grounds and roadsides. The planting of their small school yard will be a good beginning, but it is to be hoped that not many years hence the boundaries of the yard will extend until the lot is large—five acres—ten acres—forty. In the Government Bulletins I read of schools in New Jersey and Colorado that are starting with seven acres, and our own new Township School at Houghton has forty. Our National Commissioner of Education is urging the large yard and the farm school. Is this too much? I own that when I first heard Professor Roth, the enthusiastic Forester of our University, maintain that school lots should be not less than ten acres, I thought him extreme, but when I hear all that a ten acre lot can do for education of the school and the community, it seems moderate, and most wise, and only strange that it has taken so long to arrive at that wisdom. The world seems to have waited until the 20th century for it to be held up as an ideal—perhaps it will not wait another century before the ideal is being widely realized, for progress is rapid in these days. A ten acre lot, equipped with all of the trees, flower and shrubs of the locality, including stock to be used in teaching fruit culture, would make a first class laboratory for the study of the ways of Nature, and would “pay for its keep” many times over in a few years by the higher efficiency of the people of the neighborhood as farmers. I am told that it would pay well as a wood lot, covering fuel expenses and even giving some revenue, while a forty acre wood lot would pretty nearly endow the school and set the community free from school taxes, aside from its value for teaching purposes. What valuation should be put upon it as a things of beauty in the neighborhood, a park where people could gather for picnics, and public gatherings that can be held out of doors? Should cities have all of the parks? Some cities now have more of natural beauty than the open country. It is enough to say that the ideal school of the future will be a building that will not “just do” but a dignified public edifice, an index to ideals of neatness, beauty and efficiency, as wsell as the learning from books, and where the community will meet to consider social betterment and to enjoy social privileges. It will be surrounded by flowers, which the children love, and tend as part of their work; it will be surrounded by the park of the district. In the city each school will have its garden, and every district will have its playground and park space. The entire essay can be read in the Nelson room of the Woodmere branch of the Traverse Area District Library. Pages may be photocopied for those wanting to read it carefully at home. Header image courtesy of the United State Forest Service Region 5, https://www.flickr.com/photos/usfsregion5/3598029211. In this month’s “Celebrate the People,” we celebrate the long memory of Kathleen “Katy” (Adams) Hedden née Webster, a life-long Kingsley resident. Born in Kingsley in 1936, she lived on Fenton Street during her formative years until after her own children had grown. 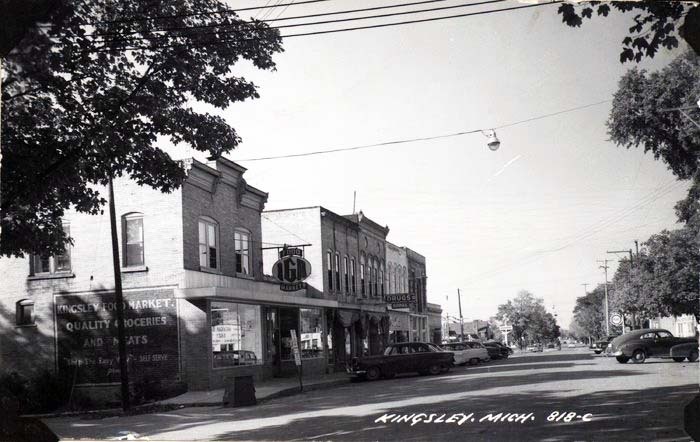 Her uncle, Floyd Webster, has been the Kingsley historian since the 1950s, and her attention to detail in this interview reflects a family love for Kingsley history. She continues to tell stories about Kingsley people and businesses, although she has joined the ranks of the ‘snowbirds’. See you in the summer, Katy! Profuse thanks goes out to interviewer Connie Newell and editor Pete Newell. Without their dogged persistence, we likely would not have this interview to enjoy today! As always, Grand Traverse Journal is keen on publishing the stories of people that make up our communities, so please, take the time this New Year to get your stories down on paper for future generations, and submit them to the Journal! C: What were your parents names? K: My mother’s name was Claribel Wales, the oldest of 6 children born to George and Ina Wales, in 1916. 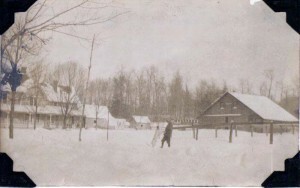 They lived on Old Mission Peninsula. My dad was born in Alma, Michigan in 1908, his parents were Walter and Martha Webster . His name was Carl, he had 2 sisters and a brother. C: Were there doctors in town? K: The only village doctor when I was a child was J. J. Brownson. My grandmother Martha Webster, a mid-wife worked with him. He was a horse and buggy doctor. C: How did they come to live in Kingsley? K: My dad and his parents moved here when he was a child, as did my mother and her family. My Webster grandparents lived on Blair Street in the house where Diane and Dan Walton live. My mother’s parents lived on a farm two miles east of Kingsley where Mom spent most of her childhood. She and her 5 siblings walked to the old Sparling School which was located on Wood Road, it was a K through 8 school. I don’t know anything about my grandparent’s education. When my mother advanced to the ninth grade, she had to transfer to the high School in Kingsley . Of course there was no bus service, she walked 2 ½ miles to and from Kingsley every day. As the roads were not plowed in the winter , she boarded with a family in Kingsley for the winter months. My mother was 19 years old, had one year of college, and worked as a bookkeeper at Kingsley Co-op when she and my Dad were married. The old Sparling School now sits on Fenton Street in Kingsley on the back of the Earl Haycraft property. K: During the logging days, the lumbering companies hauled logs to the top of the high roll-away, located near Buckley on the Manistee River. There, logs would be rolled into the river and floated down to the mill. My mother-in-law and father-in-law were Sam and Joy Adams. One summer Sam Adams, and Frank Kolarovic, (his son, Jim, lives across from the post office) were part of a crew hired to work the river finding dead heads, (sunken logs that had hit snags), freeing them and floating them down river to the mill. My mother-in-law, Joy, was hired to cook for the crew in a little shack built on the raft for shelter. It was too dangerous for my future husband, Larry, (her two year old son), to be allowed to run free and get in the crew’s way or venture too close to the edge of the raft that had no railing, so he was tethered with a rope and they spent most of that summer on the Manistee. C: Where did they get married? K: I think my parents were married in Traverse City by a Justice of The Peace. An interesting fact involved the old Kingsley telephone office. All were party line phones and had to be manually connected to anyone not within a close geographical area, so the telephone operator heard everything on the phone lines to and from the 500 or so people living in the Kingsley area. My dad went to Traverse City to get the marriage license, but he couldn’t remember my grandma’s maiden name and it had to be on the license. He called through the Kingsley Telephone Office to talk with my mother and asked, “What is your mother’s maiden name?” Before he got back to Kingsley everyone knew that Carl and Claribel were getting married and he had gotten a marriage license that day. C: What did your father do? K: Most of his life, he painted and did wallpapering. My mom didn’t work outside the home until I was old enough to baby sit myself. She took a job as cashier at the Kingsley IGA store which is now the pizza place kitty corner from the Post Office. After my parents married, they moved into a little apartment behind the tavern that I think was owned by Bean Shaftee, brother of Rosie Hooper, Joe Hooper’s mother. The tavern was located where the Subway sandwich now stands. Later Bean had a furniture store there. After the furniture store, it became a series of gas stations, first a Pure Station, and later a Shell Station. After the gas stations, it was purchased and became the Dairy D soft ice cream shop owned by Cal and Phyllis Kroupa. I worked there one summer when it was owned by Cal and Phyllis . It was later sold to Keith and Pauline Aeschliman. After that it was owned by the Gomez family and Phil had his barber shop in the room on the north end of the building. I was maybe a year or two years old when my folks moved to the house across from the Methodist Church. In my early childhood, we had an outdoor toilet and used the pages of catalogs for toilet paper. I think that was pretty standard back in the ’30s. Those colored pages, were heck. My great grandma Keffer had a “two holer.”She had taken an old fur coat, cut a hole in it, put it on the seat, so you wouldn’t have to sit on that cold piece of wood in the winter time. It was a fur lined toilet seat. How is that for comfort? We lived there on Blair Street until I was about 5 years old when my folks built a house on Fenton Street. After I married, my folks bought land on the Boardman River and built a new house there. My husband, Larry, and I bought the Fenton Street house from them. I lived there from the time I was a small child until after our children were grown . Larry and I bought the Floyd Adams farm on Blackman Road and built our house overlooking “Adams Pond” . Kingsley hardly resembles today what it was like as I was growing up, except for some of the old brick buildings in downtown Kingsley. In a town the size of Kingsley, everybody knew everybody and when someone passed away I remember a lady who went house to house, Mrs. Marion Manigold, asking for donations for funeral flowers for the deceased. People just expected to help. It was part of our lives. C: What was your first husband’s name? K: Larry Adams. Larry and I were engaged to be married just before I started my senior year of high school. He gave me a ring on my birthday in August and we were married in July of the following year. There were 26 students in my senior year of high school . A couple of boys dropped out at the end of the first semester joining the Marines, leaving only 24 to graduate. Four of the graduates went to college, continuing education wasn’t any big thing then. C: How long were you married to Larry? K: 45 years. He died of cancer that he had battled for sixteen years. C: When you were young, what was there to do in Kingsley? Were there theaters? K: There were free shows every Saturday night in the summer. When I was a teenager, movies were held next to where The Rock teen center is today. Previous to that, and still visible, a big white movie screen was painted on the south wall of Kingsley Automotive that was Baldie’s (Cleland) tavern at that time. There were wooden benches for seating where the fitness center stands today. Farmers would come into town Saturday nights, get groceries, bring their families, and stay for a free show. The village merchants stayed open and they financed the rental of the movies. Ken Mox opened a hardware store where the fitness center is today, after the movies were moved from Baldie’s to the lot south and east of there. Next door to that Wayne Lewis opened a barbershop, which later became a beauty shop. K: I did a lot of baby sitting for Henry Mox, who, today, is remodeling the house in which he was raised, on the corner of Fenton and Brownson Streets. His dad, Ken, owned the hardware store in Kingsley and his mother, Mildred, went to the store every afternoon to do the bookwork while I took care of Henry. As soon as I got out of school, I would go to their house. While I took care of Henry, I did dishes, vacuumed the floors, and did errands for 25 cents per hour. There was always a sink full of dirty dishes. I took care of Henry for several years. A few years later Henry’s brother, Mark was born, and I took care of him too, when he and his mother came home from the hospital. I did a lot of babysitting during my high school years. I was the last female paper carrier for The Grand Rapids Herald newspaper. I delivered papers from when I was 12 or 13 until I graduated from high school. I don’t remember how much I earned, but the paper cost 20 cents a week for delivery. I can remember one person who gave me a tip every Saturday, which was collection day. He always gave me a nickel tip. K: I also sat for Claude and Mildred Smith who lived in the upstairs portion of the Smith funeral home. I was always a little uncomfortable, knowing there was a body or two downstairs. Shenbelle, the oldest of the children liked to greet visitors at the shared entry door of the apartment and funeral home. One of the regular visitors was the Traverse City Record Eagle paper carrier, Larry Adams. He loved to tell the story about going there to leave the paper and little Shenbelle would greet him at the door and say, “Would you like to come in and see the body?” He never did. K: There was a new nursing school in Traverse City at Northwestern Community College. I decided that I wanted to enter the program. I had not taken chemistry in school, so before school started in the fall, I went to see Joe Bellinger, the superintendent of Kingsley Schools, (then known as Paradise Township Unit Schools), and told him that since they had the nursing program beginning in Traverse, I would like to go for an RN, but I had not taken chemistry in high school, and regretted not having taken it. I wanted to come back to school every day and take chemistry with the high school students. I was accepted back to school and took the class. Announcements were made over the P.A. every day. One morning during class, the announcement came, “Katy Adams, would you come to the office when class is over?” I was so embarrassed in front of these kids, I was 28 years old then with a bunch of kids who were 17 or 18 and I was getting called to the office. I went to the office right after class. I talked with my husband, Larry. He didn’t have any problem with the job offer. So I canceled my thoughts of nursing. I kind of weighed it, because I would have to go to college for a few years to be an RN and would be driving every day to classes, and have extra expenses. To have a job at school, I would just walk a block to work and would always be home weekends with my husband and children. My hours wouldn’t be much longer than my children’s school hours. It seemed that was the way to go. So, when I accepted the job, he said, “Now you will really stay after you baby is born.” I said that I would. I stayed for 32 years. C: What did they pay to start? K: I started out at $3000 a year which was OK back then. C: What did you wind up making? Did you get insurance and a pension? K: Yes. When I left the school position, I was getting over $16 per hour. I knew, initially, that my job entailed almost everything. I did all of the general office work, helping out with secretarial duties for both elementary and secondary principals, as well as the superintendent, all of the bookkeeping for the district, the hot lunch account, the check writing, the payroll, and whatever else popped up. At that time, Larry was working for Schall’s Bread Company in Traverse City. 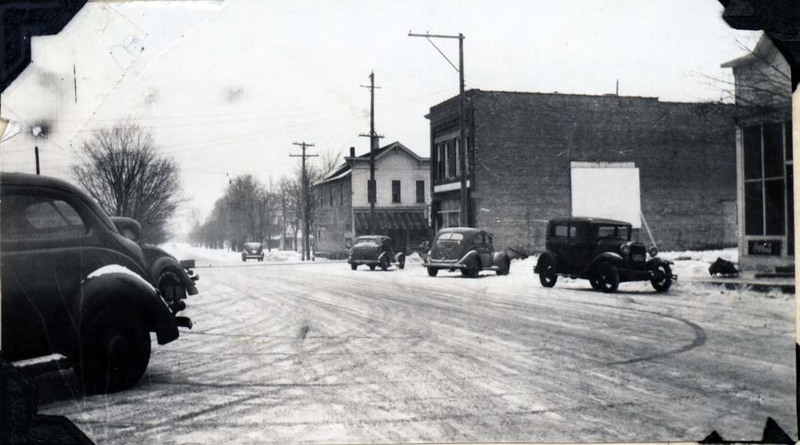 He had a route going store to store from Traverse City to Elk Rapids delivering bread, rolls, and other baked goods. C: Did Larry paint houses? K: My husband never painted. My father painted. Grandpa Webster, my dad’s father, painted for years, but he ended up retiring from Parts Manufacturing plant in Traverse City. My dad had various jobs when he was a young man. He cooked in the C.C. camps and later was a cook on an iron ore ship on the great lakes. My son has two degrees from Ferris State University and worked as a personnel director for United Technologies and later as business manager for Thomas and Betts, both in Boyne City. He tired of that and he now has a successful painting business and has several people working for him. I think painting is in the Webster blood. C: What are your kid’s names? K: My oldest daughter, is Lori Lynn Norton, the wife of a minister. Lori and Terry have two children. He’s had four churches since they have been married. C: Your next child down? K: My second child is Lindsey Webster Adams, who with his wife Shannon have 2 sons. My youngest is Kara Ann Schmidt, an accountant married to Damon, a mechanical engineer. C: Did you go to church here in town? 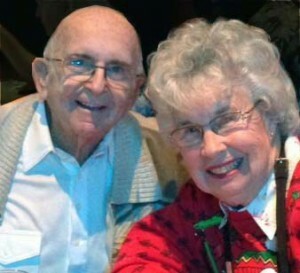 Katy and Ken Hedden, at Christmas-time 2012. Image courtesy of Kathleen Hedden. C: Did you like Ken when you met him? K: It was a blind date. Ken is a very nice person. I had met him once a couple of years prior but really didn’ t remember him. He had lost his wife to cancer a couple months before I lost my husband. One evening, a mutual friend said to me, “Shall we ask Ken if he would like to go out to dinner with us?” I said “Yes.” So, the four of us went out to dinner and afterward went back to their house and played cards. C: I bet you thought that you would never get married again. C: Were there many gas stations? K: Yes. There were several gas stations. Bob Adcock’s building on the south side was Davis’ Gas Station. Another one sat where John Sedlacek’s shop is on the SW corner of M113 and Brownson. Straight across M113 was the Standard Station that belonged to Mickey Mox. Across Brownson to the east was the Pure/Shell Station. I say that because it was first Pure then Shell. What is now the vacant lot west on the SE corner of Cottage and M113, there was a grocery/gas station. Some of the owners that I recall over the years were Harold Vogue, Chet Berdinski, and Durwin Mackey. On the next block, where the ice cream shop is now, SE corner of Clark and M113, was an Old Dutch gas station owned by Al Hoeflin. There were several grocery stores on the main street (Brownson) in Kingsley. The first owner that I remember was Ed Mox, then later bought out by Bob Lint and Don Westrate. The pizza place is where the IGA store used to be, and right next to that was Clover Leaf Store what you might call a dime store belonging to Frook’s. It was later owned by Louie Kyselka. Next door was Sieffert’s Grocery Store, which was operated by Thelma Sieffert and was later converted to the Kingsley Bank. Next to that was the drug store operated by Lane (Doc) Fenton. You could go right from the grocery store straight through to the drug store. Nixon’s was another grocery store but when it burned, Ray and Agnes put in a Gamble’s store . 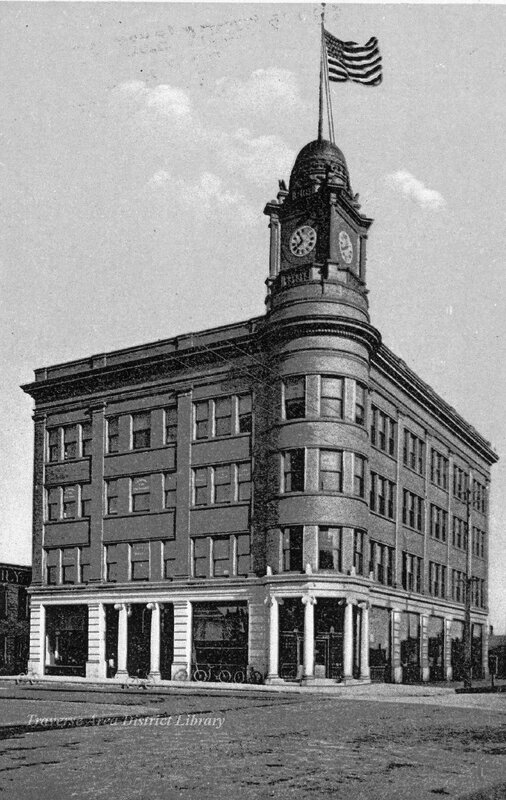 The next building belonged to Frank Baldwin. He had a barber shop in the front and in the back was a pool hall with always a card game going on. Grandpa Webster spent a lot of time playing cards there which really irritated my grandmother. K: I lived on Fenton Street for about 40 years–from when I was a small child until my children graduated from high school. Floyd Webster lived right where he lives now. When he came back from the army, that was his and Melvina’s first house. He, my parents, and grandpa built it. C: You said that your kids went kindergarten through twelfth grade in the local school? K: Yes. All grades were located in one building. C: How did your mother get clothes for you? K: She made them when I was a child. I don’t know how old I was before she got a washing machine. Before that she used a scrubbing board. C: Did you mind being an only child? C: Did you as a teenager do the sleep over thing? K: I didn’t really do much of that. One thing I enjoyed, growing up, was roller skating. For several years, while I was in junior high and high school, a company would come once a week with roller skates. The school would open up the gym, students could come there and rent the skates, have the music going and roller skate. They would have special things to do. The girls would line up and the boys would line up, and you would pair up according to the position in each line, much like a reel. Another thing we did as kids—the pond on our street, it’s still there behind the Westrate house, that’s what we called “The Little Pond.” It always froze over early in the winter time because it was shallow. We would meet there every night and bring our shovels, clean it off, skate, and get warm by a bonfire . As the winter progressed, what we called “The Big Pond” would freeze, and our gathering would go there, what was a lot bigger than it is now. K: By the time my kids were old enough to go ice skating that area of Fenton Street was being built up, so the village built a rink at Brownson Park, and it was well lit. The town kids would walk there and skate afternoons and evenings. Broomball was popular, especially with the young boys. C: Who were the wealthy people in town? K: I think Frank Saylor was the only one that I would have called wealthy. I remember that Al Hoeflin, who had the Old Dutch gas station, had the first television in town. My dad had the second one and Rex Henschell had the third. You knew who had TV’s because of the tall antennas that were necessary to bring in the only 2 channels, Green Bay and Milwaukee, were available. I was on the village council quite a few years. Not many people showed up to the meetings.